So let's come back to my review. I've been wanting my own set of make up brush because I'm also a big fan of YouTube Makeup Gurus! I really love seeing people apply their makeup and draw their eyeshadow with different kind of brushes because they can create nice and balanced make up on their face and eyes! Sadly, I was using my hands and fingers to apply my makeup all the while, and I really hope it's not the cause of my acne-prone skin! I've tried to purchase some random brand of make up brushes to use, but... meh. My hands and fingers are better applicators. As usual, Natta Cosme has included extra gift and a sweet note for us. This time is a super cute Expenses Book! Sooooo cute!! The Cerro Qreen Fashion Makeup Brush Set comes with several colours, and I've got the one in Carmine Red colour. Unlike the pink brushes comes with pink pouch, purple one comes with purple pouch, I'm surprised that my red brushes actually comes in a professional-looking black leather pouch! Don't chu think it's just looks like what professional makeup artists using?? This set of brush set contains 10 types of makeup brushes, from face to eyes and to lips. Each of them were protected in a plastic wrap before you start using it. Of course you can throw them away because the pouch was attached with an extra protective part to cover the brushes so that they won't get dirty easily in the pouch (unless you dirty-ed your pouch lah). Close up look for the Carmine Red, and Cerro Qreen's pretty label on top of the handler. So let's get started with the close up look and details for each brushes in the brush set, shall we??? How I use it: Normally it was used on loose powder but I don't have any powder brush so I don't really use it unless I need to. My thoughts: The hair's softness is just acceptable, not too perfect. If my foundation is sticky, some tiny hair will come out and stick on my face. I will get myself a loose powder to try with this brush soon to see if it's really good. How I use it: I used it on a blusher and sometimes contouring if I need to. My thoughts: I previously use the given puffs, but I found that this brush works the same too as it's able to grab an appropriate amount of the powder blush. Besides, this angled shape brush blends in the color very easily and naturally on my cheek bones. How I use it: After squeezing an appropriate amount of BB/CC cream or foundation, I used the brush to take a little bit of the cream and apply it onto my skin and blend it using dabbing motion. My thoughts: Like I said, I normally use my hands and fingers to apply make up, and I never use a foundation brush to apply my base colour before. It took me a while to get used to it. So far I think it's kinda fun to use a brush to apply my foundation because the brush is quite gentle towards my skin, and it's able to blend quite well. How I use it: I used it to swipe away excess cosmetic products on my face and eyes, especially when I'm using glittery eyeshadow colours. How I use it: I used the large one for my eyeshadow base colour, and the small one is for the corner darker shadow colour and sometimes to blend my eyeshadow. My thoughts: The brushes are very soft and gentle on my eyelids, and I fall in love with my own outcome of the eyeshadow every time because they can really blend the colours well. 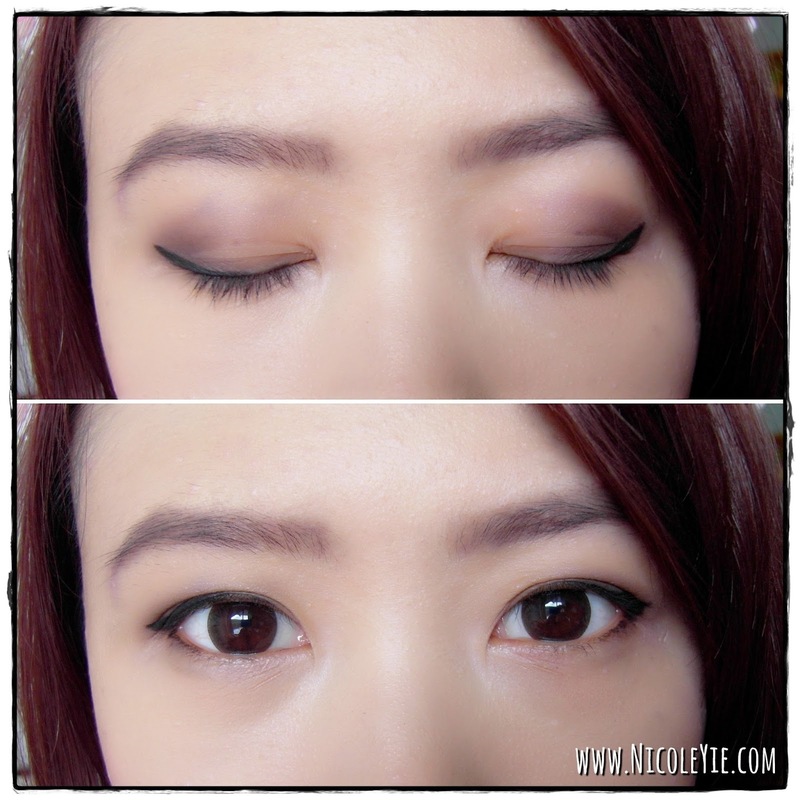 How I use it: I used this on a gel liner to draw my eyeliner. My thoughts: This brush is more suitable to be used on gel eyeliner cause it's a fiber bristle. Personally won't use this much cause I still haven't pick up the skill to use this brush to draw my eyeliners. But at least I have an alternate choice to draw my eyeliners if I'm out of other eyeliner tools. The outcome after using the 3 brushes for my eye makeups. My thoughts: I find that angled brush is so much easier to draw my eyebrows and eyeliner as it's more precised. Really love this brush as the brush is really soft, and I felt comfortable to use it on my eye area. How I use it: I used it to brush my eyebrows, and sometimes eyelashes if I need to. For eyebrows, I swipe my brow hairs upward for the inner part, then outward for middle part and downward for the outer brow hairs. My thoughts: I actually don't really like to apply mascara because I hate to remove it. And that's why I don't really use this on my eyelashes. The brush is not too soft for eyelashes, but it's not harsh for my eyebrows, so I'm kinda lovin' it to brush or comb my eyebrows. In case you wonder that where got people use another eyelash brush to draw mascara while the mascara is already comes with their own wand?! Recently I just found that there are people who don't really use the original mascara wand. 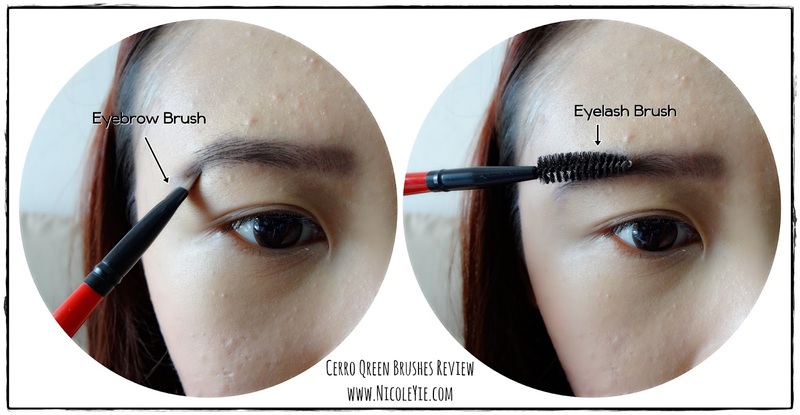 They use eyelash brush to swipe on the mascara to apply on their eyelashes instead. I have to say that these people are just too hygienic. 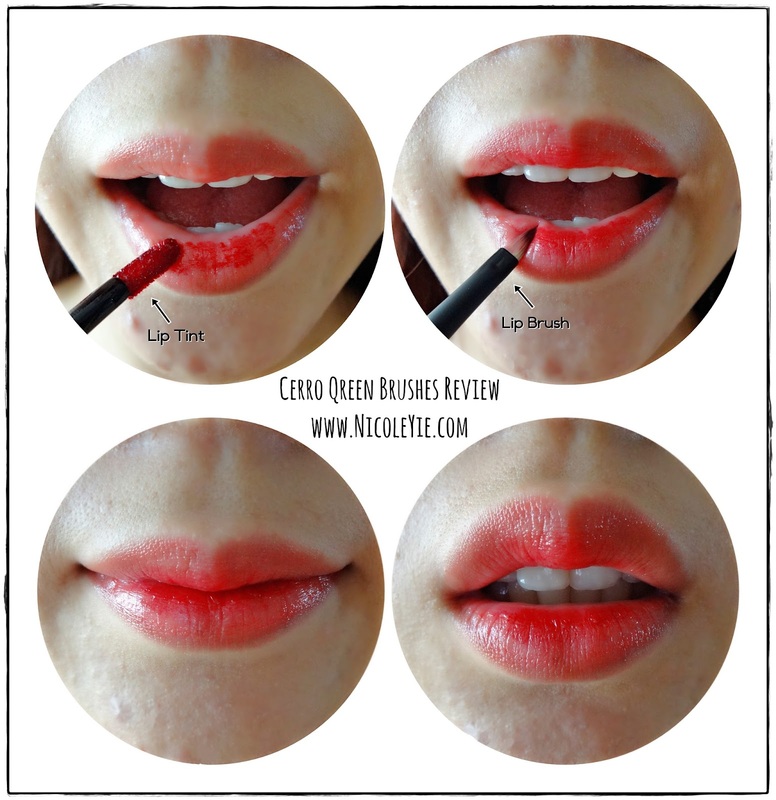 How I use it: Normally I will only use it when I want to make ombre lip colour. I will dab the lipsticks or lip tint on my inner lips after applying a lighter base colour, and use the lip brush to blend the two colours together. My thoughts: Previously I used my fingers to blend my lip tint onto my lips and it end up annoys me very much as I looked like I just bleed on my finger, so lip brush is something I really need now. I love the pointy part as I'm able to make a precise lip shape with it. The lip brush was kinda hard at the beginning, but you'll get used to it after using it for a few more times. And in case you wanna know, there are also hygienic people out there never want to apply their lipsticks directly onto their lips, so they used lip brush. Just to show that the lip tint was in the inner part of my lips. Yup my lips are always dry and it end up look something like this, but I don't care cause I love to look like a vampire. My final look after using this brush set to do my makeup! In overall, I actually love the brushes for eyeshadow and eyebrows the most. I recommend to try at least their eye makeup brushes because they are really soft. For the price of less than RM100 and you can get 10 brushes in a pretty pouch, how wonderful! Here's a video of how I use the brushes in my ball night make up! Can't wait for you video! "This brush would not applicable if you don't use gel eyeliner cause it definitely don't works well with eyeshadows. Personally won't use this much cause I still can't pick up the skill of using a brush to draw my eyeliners. But at least I have an alternative choice to draw my eyeliners if I'm out of other eyeliner tools." Is me again (the one above). I think it will be good if you have an editor to look at the entire thing you posted. I am by no means a very good writer myself but at least I can see jarring or obvious mistakes. This will be my first time explaining to someone about grammatical issues because it should be expected that you find someone reliable to sit down and go through your blog posts. I am only a reader and commented because this may be read by non-Malaysians too and it may not be easy for them to understand. "This brush would not applicable if..."
I do no get what you mean by this line actually, it makes no sense to use the word "applicable" here. When you use "would not", then it should be with "be" after that. Whereas, you can use "not applicable" if it has "is" or "are" before that. Next one is "it definitely don't works well with eyeshadows". It should be "it definitely doesn't work well with eyeshadow". Maybe you can start to converse more in English to correct this grammar, because I see that it is a very common mistake among we Malaysians and I have some friends who make this mistake too because they are so used to saying just "don't" aka short form "dun" in everything and no longer use "doesn't". As for eyeshadow, I don't normally see people using it in plural form as in "eyeshadowS" so I think it should be just eyeshadow, although I understand it has a lot of colours in an eyeshadow palette. "'Personally won't use this much cause I still can't pick up the skill of using a brush to draw my eyeliners". Not wrong but it can sound better with "I still haven't pick up the skill to use a brush". If you use "haven't" here, then it can mean you will learn, take the effort or may know how to use a brush to draw eyeliner in future. This is to give a better or more positive outcome for a blog you are posting for others to see. "But at least I have an alternative choice to draw my eyeliners if I'm out of other eyeliner tools." It should be "alternate" choice instead of "alternative". Alternate is use for replacement while alternative is like a second option that doesn't function as a direct replacement. 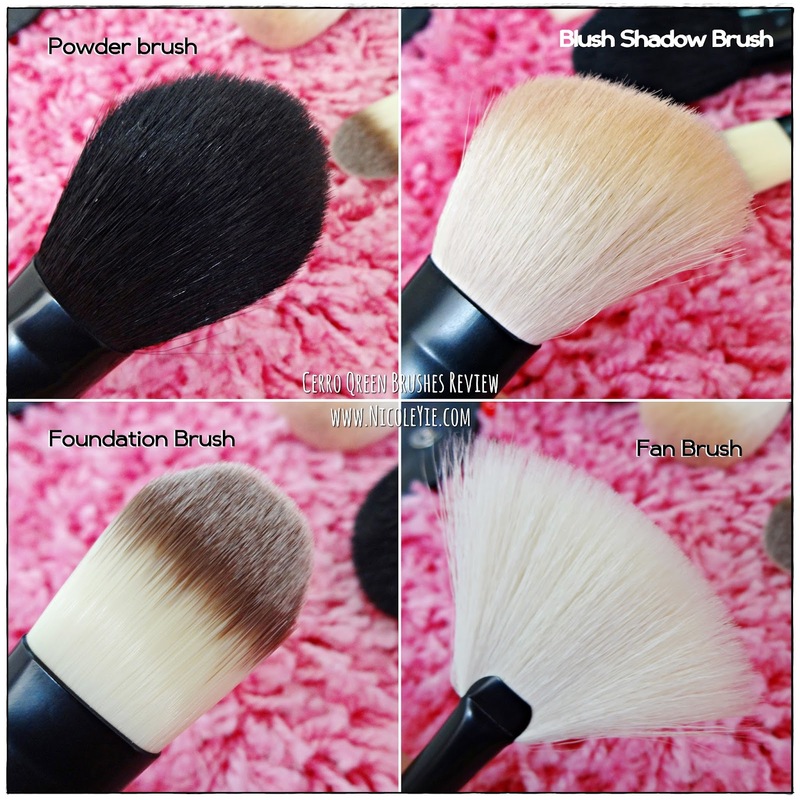 Wow this makeup brushes is really amazing, Thanks for the information and links you shared this is be a useful and quite informative! very beautiful makeup brushes..Thank you! I have to say that this set of brushes is perfect for those who are looking for a good set of makeup brushes that is not too hard on their pocket and is portable enough to carry around for any event or occasion.